The Majestic Entranceway is the perfect finishing accent to any install. This is a perfect example of the classic touch. First off, holding up the gate is an 8×8 Majestic Post. If this were real mahogany, the cost would be immeasureable! Unless your customer is willing to trade their car for real mahogany, chances are they aren’t getting it. This is literally the difference between hundreds for your Grand Illusions 8″ x 8″ post vs. THOUSANDS for the real thing. And that’s just one item. 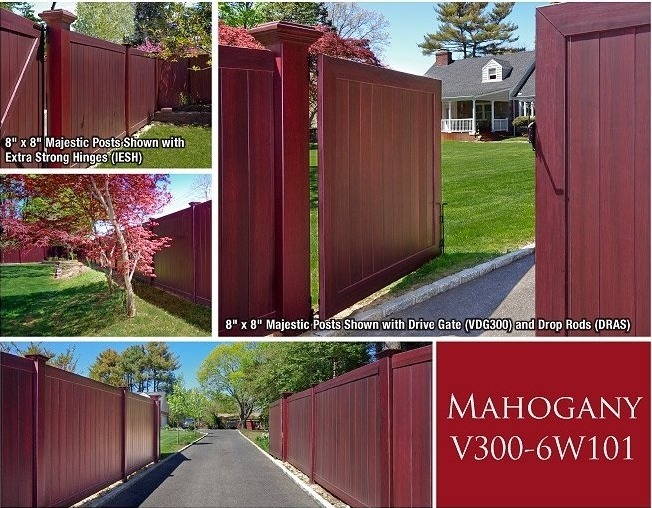 The overall savings for the customer is thousands upon thousands of dollars vs. a real mahogany fence. Throw in the fact that this will NEVER need maintenance save for the occasional wipe down. No hours of treating or staining. No worrying about the cost to replace a rotted post in a couple of years. Added bonus: just look at it! It’s gorgeous! 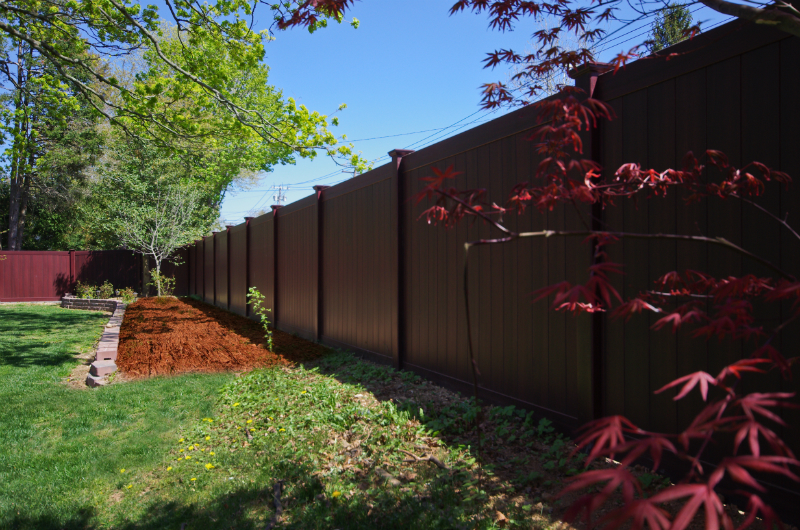 So your customer is dead set on a wood fence? They’ve looked through catalogs, perhaps they’ve spent a little too much time on Pinterest. Now they’ve decided they want a mahogany fence. Unless they have oodles of cash in the bank, that’s probably not going to happen. Take a look at the above pics. It’s the next best thing, actually it’s arguably better! Q: What drew you to the Grand Illusions Vinyl WoodBond Mahogany (W101)? A: It looks like real wood. We thought the color would look excellent with our property. The green of our grass with the dark red color of the Mahogany just seemed to appeal to us the most. 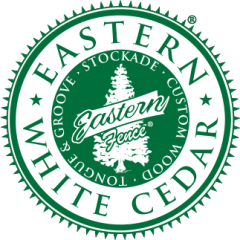 Q: Were there any other competitive woodgrain brands that you were shown when you were getting estimates? A: No. We got a couple of other estimates, but they only offered white and maybe another color. We wanted something different. The way we see it, we didn’t want just white. If you look at something every day and you’re not happy, then it’s not worth it. We like something different. We like the dark colors. Q: Would you find yourself recommending the Grand Illusions product to other people? A: Of course! A lot of people stop by and ring my doorbell to ask me where I bought it. The name, the company, everything. lt looks great. We love the fence, so of course when somebody else (other than your family) agrees with you, it’s terrific! Q: Do you have anything else to say about your Grand Illusions install?